Today’s blog is all about The Quantum Mind. I commissioned a piece of art to capture the whole concept of a quantum radical. When I hand my business card to people, many ask what the radical part is all about. The radical part is all about thinking about traditional things in new and exciting ways. I decided I needed a little help in describing the concept. And what better way than a work of art. I worked with two artists to get the concept down on canvas. Paulette Gilmore is my designer–her company does all my branding and website work (Creative Visions International: www.cvint.com). Paulette is a great artist in her own right and was instrumental in launching the whole Quantum Radical branding three years ago. She is the one that created the wave function icon (Psi on a field of forces emanating from a central source of power). Joey Havlock (www,havlock.com) is the artist that specializes in surrealistic paintings. I saw some of his previous work and thought his style would be a fantastic way to capture the essence of the Quantum Radical. The imagery in the painting brings together a number of concepts that when integrated provide the basis for my thinking about being a Quantum Radical. First, the shimmering water represents the phenomenal power that simple H20 has on life. Science is still finding new things out about how water behaves, especially when constricted inside nanotubes. If the nanotube diameter is small enough, the water molecules within the tube essentially take on the behavior of an electrical wire. It is a lot more complex than that, but think about what living cells have in them–lots of vary narrow nanotubes filled with water. Makes you wonder. I’ll talk about this more in a future blog. The second feature of the painting is the model of an atom with electrons orbiting around the nucleus just above the water in front of the head. The atom is creating the light which is reflected off the water onto the face. From basic physics and chemistry, when an electron changes its orbit it either captures a photon (a piece of light) that raises the electron to a higher orbit (higher energy) or the electron emits a photon (radiates light) when it descends to a lower orbit (lower energy). That is how it works at a very basic level. This will become important later and is related to the electrical behavior of nanotubes and water. And it has a lot to do with how your business operates–yes, a topic for another blog. The third major feature in the painting is the background. The background includes the artist’s impression of the double helix of DNA. But it also includes atoms and galaxies–subtle, but if you look for them they are there. This represents the interconnectedness of the universe. More on that also in later blogs. Everything is connected. The next major feature is the two hands trying to grasp the atom. One of the defining features of homo sapiens is our ability to use our hands to build tools. The most powerful tools we have created come from the power of the atom–at the quantum physics level. And what is the most powerful tool we have ever created? Of course, it is our minds. 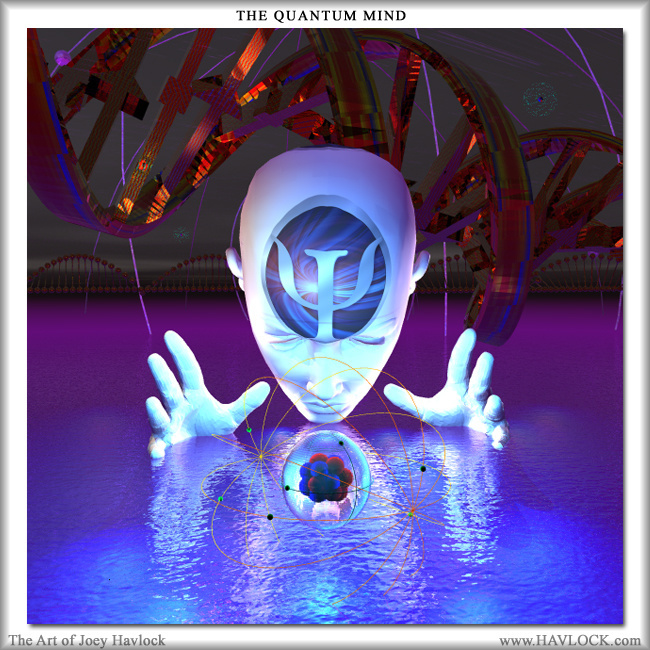 The final major feature in the painting is The Quantum Mind. Our minds are quantum computers–and the best ones ever created by Nature–to the best of our knowledge. Yes, your brain is a warm, wet quantum computer and it embodies the human mind, the most fabulous machine in the universe. The head and face are central to the mind. The Psi symbol represents the power of our quantum minds. The eyes are gazing at the atom and the mind is trying to fathom the deep secrets of quantum physics to build even better tools to improve human civilization. It looks almost like the Quantum Mind is conjuring up powerful black magic. Well, to tell you the truth, quantum physics is extremely complex mathematically–and often seems like black magic–but it is quite simple and elegant in its concepts. I will use those concepts to help you think differently about your business. That is what the Quantum Radical is all about–helping you see your business through a different lens. This painting captures all of the important elements that define the purpose in creating Quantum Radical Innovations–to help you fathom the depths of quantum physics so you can apply its concepts to the everyday aspects of your life especially in the business, leadership, and management arenas. I’ll take the complex mathematics out of the equation, and just bring you the simple, elegant concepts. And then, show you how they can fundamentally alter the way you think about your business. My next blog will give credit to pioneers in the application of quantum physics. I’ll take you to the beginnings of my thinking about starting Quantum Radical Innovations. I hope you like the painting. I am now reading Howard Bloom”s “The God Problem.” Growing up, I always thought that science underestimated the magnificence of the universe. Howard Bloom has certainly made a noteworthy attempt to describe the underlying themes of nature that intersect to give us such a magnificent universe. One of the reasons that I studied Physics in college was to better understand what makes the universe tick. I enjoyed quantum physics and did very well in that subject. Today I have come to believe that we are at the threshold of even more dramatic technological and philosophical change based on incorporating more and more quantum field theory thinking into our daily lives. QFT will change everything including how we organize, lead, and prosecute human affairs. By taking a quantum view of things, especially during these radical times, I think we can begin to think of out-of-the box, beyond-the-envelope solutions to previously unsolvable human problems. Of course, eventually even QFT may be surpassed by an even better “theory of everything” (perhaps string theory?) and we will have to reinvent ourselves in the spotlight of the new theory. But for now, we live in a quantum world and we need to make the effort to reinvent ourselves as Quantum Radicals.